More than 70% of smartphone users in India switched brands in the second quarter of this year, befitting Chinese smartphone maker Xiaomi the most which sold nearly 37% of the phones that were replaced, according to a CyberMedia Research (CMR) report. 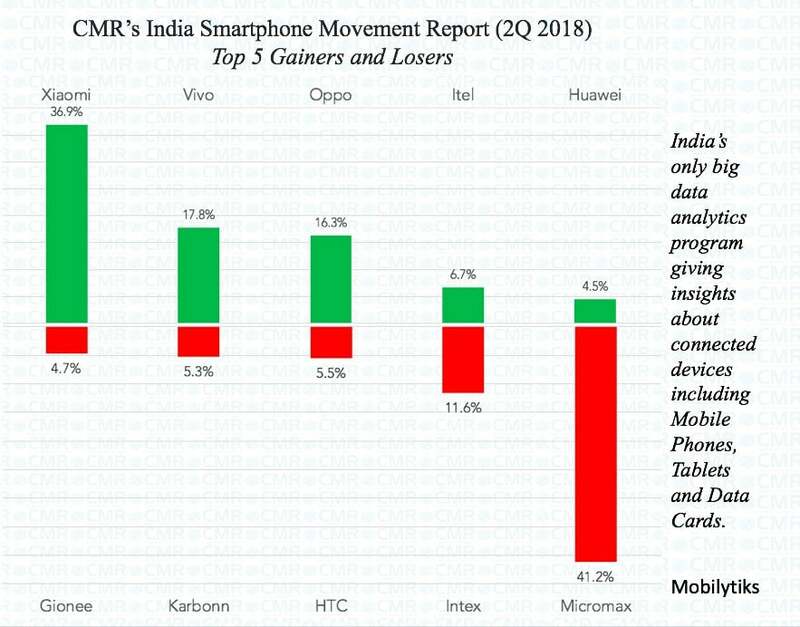 Xiaomi was followed by Vivo (17.8%), Oppo (16.3%), itel (6.7%) and Huawei’s Honor (4.5%), according to the first edition of the CMR “India Smartphone Movement” report. During the period, the fastest depleting brands in the category were Micromax (41.2%), Intex (11.6%), HTC (5.5%), Karbonn (5.3%) and Gionee (4.7%), the findings showed, as reported by IANS. “Customer stickiness is the paramount concern that homegrown brands need to address immediately,” said Kanika Jain, Manager, New Initiatives, CMR. “Consumers continue to swap their existing Smartphones with the new ones offered by Chinese brands resulting in fast erosion of total installed base of the local Indian brands,” she added. Based on the analysis of over 200 million users across the country, the report further identified that the replacement market continues to grow in the country and in the second quarter of 2018, nearly 60% of the smartphones sold were actually upgrades/replacements of existing smartphones. There is still 41% of new smartphone market development occurring in the country, which could be a pie that the domestic brands should focus upon, the report suggested. This is good news for the Chinese company Xiaomi as more users are trusting the company and moving out from their existing brand. According to a Counterpoint report released earlier last month, Xiaomi is still the leading smartphone brand in the country, but Samsung has narrowed the gap, thanks to the strong sales of Galaxy J6 and J8 devices. Xiaomi has a job to do in the third quarter as Samsung has already launched a couple of mid-range smartphones, while Xiaomi is all set to unveil the much-anticipated Mi A2 smartphone in the country. The Xiaomi Mi A2 may not receive much reception from the consumers as Honor has recently released the Honor Play smartphone with flagship Kirin 970 SoC at just Rs 19,999, which makes it a clear winner over the stock Android-powered Mi A2. I am surprised there is no mention of Lenovo + Moto, which lost over 50% of it’s usershare in the last one year. Even Lenovo CEO admitted their product line was inappropriate for the Indian market. Maybe CMR didn’t care at all about Lenovo and Moto (who uses these phones anyway!). Brother, there’s perfectly no harm in buying Chinese smartphones..
I’ve thought Micromax Bharat brand is somewhat different, specially the Bharat 5 Pro. If anyone bought that, please share your experience here. I mean the hardware quality, software speciality, whether any Chinese apps are preinstalled etc. Keep in mind the “value for money” thing.